The creation of an Institute for Integral Health that will ideally treat and heal individuals using effective, low cost and resource efficient approaches based on a synthesis of western medical knowledge and traditional healing systems as well as modern discoveries in energetic medicine and environmental science. Preventative approaches will be a major focus. Health care providers and team members selected according to their commitment to communicate, collaborate and learn from each other. The Institute will research new, innovative, cost-effective and gentle therapies and impart training to individuals and health practitioners. A primary focus on ecology and environment through the use of green building technologies, alternative healing techniques that require less resources than many of the current techniques of western medicine, and promoting healthy lifestyles that counter the modern consumptive pattern. We envisage the Institute of Integral Health to expand and grow in line with the growth of the Auroville population (estimated up to 25,000). In order to serve this growing population, we anticipate that the Institute will eventually need almost 3,500 sq. m. of covered space, and include 40 inpatient beds, 20 consultation rooms, full- fledged diagnostics, imaging and scanning facilities, a pharmacy, surgery, birthing centre and other health services including group therapy rooms and conference facilities. Phase 1 was intended as an outpatient clinic with a minor operation theatre, emergency room, 6 consultation and treatment rooms, 1 in-patient room, a lab and a pharmacy. This stage included only those requirements for which construction could be completed quickly so that essential healthcare operations for the existent Auroville residents could shift from it’s squashed, temporary clinic to a permanent home, with enough space to offer a peaceful and private environment for quality health services. The estimated built-up area of Phase I is 640 sq. m. with an estimated cost of Rs.115 lakhs (230,000 USD). Additionally, infrastructure costs were Rs. 11 lakhs (22,000 USD), and equipment cost Rs. 35 lakhs (70,000 USD) with a grand total cost of Rs. 175 lakhs (318,000 USD). Phase I construction started in 2011 and was completed in August, 2015, after a long but determined struggle to fund raise the needed resources to complete the initial project. The new Santé building was inaugurated on the auspicious August, 15th, 2015 and began functioning as Auroville’s integral health clinic. “The body is the bridge”, a theme-based performance cxploring horizontal and vertical space and a meditation with music was held on a relaxed Saturday afternoon on the Santé rooftop to celebrate the inauguaration. 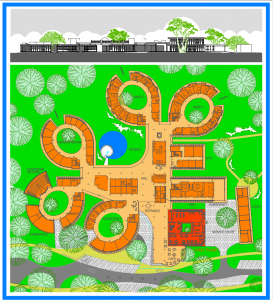 Construction for Phase 2 of Santé: Auroville Institute for Integral Health will begin shortly. It will focus on a service building facility and a much needed parking area for the Auroville Ambulance that is central and secure. 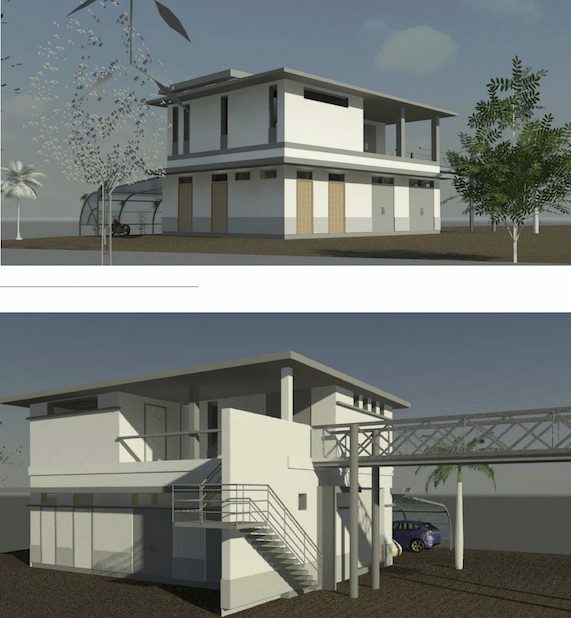 Funds for the initial construction have mostly been secured with a generous donation towards the Ambulance parking facility coming from a recent Government of India grant. We are still in need of approximately Rs. 3 lakhs (Rs. 3,00,000) in funding to afford the entire Phase 2 construction. If you would like to make a donation towards this development, please contact us directly or contribute here.